Looking for ways to motivate yourself? You thought you knew what you wanted. The drive and ambition were there. You could feel them in your bones and your heart. Whether it was completing a degree, working on a project, or implementing a new fitness regime, you were dedicated to your goal. Yet, somewhere along the line, your ambition began to waver. You lost focus and things just stalled out. Now you feel stuck, struggling to bring up the drive to get started again. You’re not alone. Consider these tips for finding your motivation so that you can move forward once again. Sometimes we get so hyper-focused on a goal that we miss out on what’s happening around us. The first step towards re-motivating yourself should always include taking a step back. This allows for a renewed perspective. Perhaps there was something you missed? Something that could help you find your ambition again? Consider whether a complete break from what you are doing is in order. If you aren’t “feeling it,” then it may not be worthwhile to keep forcing it. Walking away affords you the opportunity to refocus your energy on other things. You never know, this might create the spark that brings you back to your original goal and ambition, or it may set you on a better and more fulfilling path. Maybe you had set a major goal, such as running a marathon or starting a new company. Your goals are great! However, it’s easy to feel overwhelmed and lose your ambition when a goal is so broad. Instead, break it up into manageable, smaller goals. For example, start with a 5K, then a 10K, working your way up to a full marathon. Your dreams of corporate ownership may be better realized if you concentrate on a concrete business plan before jumping into an investment or property. Have you ever caught yourself saying, “if I only had the time”? Most of us lose motivation when we don’t believe that we have the time to work on our goals. Ways to motivate yourself may require specific planning and setting aside a designated period routinely to follow your ambitions. Use a calendar and schedule allotted time to work on your goals. Hold yourself accountable for that time. A good old-fashioned pep talk might help break up your lack of motivation so you can move forward. You could stand in front of a mirror and say to yourself, “You can do this” when your confidence falters. Or, achieve the same end by hanging a picture or changing your phone’s background photo to something that reminds you of your ambition. This could be your dream of graduating, or a picture of that literal, or figurative, mountain you want to climb. Many people also find that repeating a daily mantra like “I am capable and clear-minded. My dreams are within reach,” helps focus them on their goal. Perhaps you believe you just don’t have the knowledge or experience to fulfill your ambition. If so, seek out a mentor who can help. Mentors not only pass on their knowledge but can provide perspective, motivation and encouragement when you need it. Think about it. If you have lost the ambition to do something, question whether it’s something you really want. This doesn’t mean quitting, but it does mean reassessing what your objectives and desires are. Open your mind. Perhaps you can still fulfill your ambition in a different way. For instance, if you want to own your own business, you might need to try a few different paths before finding success. After everything is said and done, nothing helps more than just taking the plunge and going for it. For a writer, this could mean simply sitting down and just start writing. If your ambition is to be more physically fit, take that first step around the block towards a healthier you. Whatever your goal, don’t overthink it. Don’t beat yourself up for previous false-starts. Get up now and start towards your dream! Losing your motivation and ambition doesn’t have to mean giving up. Try not to think of the situation in all-or-nothing terms. Instead, consider ways to motivate yourself and approach the problem realistically. Use the above ideas or come up with your own strategies to regain your ambition. If necessary, seek the help of a counselor or life coach who can help you look at things objectively, identify mental or emotional roadblocks, and organize your thoughts. You’re still in charge of your future. With a plan and support, you can keep moving forward to achieve your goals. Ellen Rohr, M.Ed., LPC, is a senior staff counselor at the Relationship Counseling Center of Austin. Ellen helps guide both couples and individuals through life’s challenges, and provides insight when you may feel stuck in moving towards your goals. To get the perspective and encouragement you need to move forward, reach out to schedule an appointment with Ellen at (512) 270-4883, ext. 115, or visit the RCC Austin Scheduling page to request your appointment online. As the new year begins, many people start thinking about New Year’s goals and resolutions, or how they can better themselves in the months ahead. Focusing on taking better care of yourself can make it easier to complete the other goals that are important to you. Follow these 10 self-care tips as you enter the new year, and you’ll undoubtedly see how much easier it will be to keep up with your plans and goals for the new year and feel great while doing it. Everyone needs a strong support system in life, no matter what they’re going through. Whether this year has been rough for you, or you just need a group of people you can depend on when you’re feeling stressed, don’t be afraid to reach out for support when needed. You don’t have to go through anything alone! You don’t need to have a weight loss resolution to have a reason to hit the gym. Being physically active can help with so many different things—strength, mood, and confidence, to name a few! Keep in mind that being physically active doesn’t necessarily mean getting a gym membership. Do something that you enjoy to make sure you’ll stick with it. It could be something as simple as an evening walk or joining a dance class. Get moving, and you’ll feel more energized. Being more compassionate toward yourself and others is a great character trait that will not only help you to feel better but will easily rub off on others, too. When you show compassion and empathy, even when it’s difficult to do so, you’ll feel satisfied and fulfilled. Stress is inevitable in today’s world, but it shouldn’t completely take over your life. Too much stress can lead to things like anxiety and depression. While you may not be able to eliminate stress from your life completely, think about which self-care tips you can implement to reduce your stress levels. Deep breathing exercises and meditation are great options that can help to combat stress each day. An important part of self-care is getting more sleep. As a society in general, most of us aren’t getting the sleep we need. Getting adequate, restful sleep each night will help to give you energy, ease anxiety, reduce stress, and keep you healthier. Do whatever you can to create a calm, relaxing sleep space for yourself, and commit to going to bed 30 minutes to an hour earlier than you typically do. 6. Strengthen Relationships – In Person! Social media is great for keeping in touch with people and staying connected to friends and family you may not get to see as frequently as you would like. Even so, strive to strengthen your in-person relationships in the new year. Talking to someone face- to-face will make you feel less isolated, and you might be surprised at how different that person’s life looks (and how your own life looks) when it’s not filtered through a Facebook or Instagram post. Speaking of more real-world interaction, try to ditch technology more often. Smartphones can be great resources for many things, but they’re also extremely distracting. By staying off your phone at work, you can be more productive during the day. By putting it away at home, you can focus your attention on your spouse, your children, and even yourself. The less you’re on your phone, the more you can be in the present moment, which can help to reduce stress. It isn’t always easy to let go of things – especially things that have been holding us down. However, letting go of the negative things in your life, or things you can’t control, will allow you to feel a sense of peace and freedom. Whether it’s certain people, a specific situation, or something else that’s out of your control, it’s important to put it behind you in the coming year. By prioritizing self-care tips that help you do that, you’ll likely notice your negativity and stress levels go down. A big part of self-care is positive self-talk. You might think it sounds silly at first but think about the things you tell yourself daily. Chances are, you “talk” to yourself more than you realize. Unfortunately, many people only focus on the negative things they tell themselves. Maybe you tell yourself you’re not good enough, smart enough, etc. Try to turn that negative self-talk into something positive. By speaking positivity into your life, you can build your confidence and self-esteem. Soon, that will carry over into other areas of your life. It may not always feel like it, but you’re constantly growing and learning. Now that the last year has come to an end and you’re entering a new 12-month period, think about everything you’ve experienced and what you’ve learned. Think about how much you’ve grown from this point last year. You can take those reflections with you into the new year, acknowledging areas where you can continue to grow, and accepting the fact that you’re getting stronger all the time. The more you choose to value yourself and practice these self-care tips, the better this year (and many years to come) can be. Mirela Bitkowski, MA, LPC Intern, sees clients at the Relationship Counseling Center of Austin. Mirela works with both couples and individuals to overcome challenging moments and move toward a purposeful and fulfilling path. For help creating more positive changes in your life, contact Mirela at (512) 270-4883, ext. 103, or request an appointment with her on the RCC Austin Scheduling page. Feeling Restless or Unhappy at Work? Is It Time for a New Career? You check the time for the umpteenth time today. Is it time for lunch yet? Time to go home? The day just seems to be dragging by, aimlessly. Maybe a cup of coffee would help. You saunter into the break room. Oh, wait. There wasn’t any the last three times you checked. Bored, unmotivated, listless, you check your work tasks for the day. Nothing groundbreaking, nothing important. Nothing that would make a difference if it didn’t get done. What a drag. It’s not that you hate working. You just don’t like working on things that don’t excite or inspire you. Is this how you feel? Dissatisfied and restless? Dreading work each day? Could you be doing something more with your life? Is it time to change your job? Find a new career? Or do you simply need to make some personal changes to improve your outlook? Is it Time for a Career Change or a Mind Change? People often panic when they realize that they’re not happy with their jobs. They immediately think they’re in the wrong work, the wrong field, the wrong company. Well, sometimes, they’re right. But not always. If you feel like this, how can you determine whether it’s time to find a new job or you need to make changes to help you feel happier with the work you’ve got? Let’s look at a few things you should consider. There is no such thing as a perfect job. When you evaluate your level of happiness at your current work, don’t compare what you have right now with some “ideal” career that doesn’t exist. Compare it with a different, but similar work. Evaluate whether feelings of being unhappy at work would only follow you, or if changing jobs would truly change matters. Be honest with yourself. The grass is not always greener on the other side of the desk. 2. Ask yourself: Do I dread Monday mornings? Think about that for a moment. If you really do dread going to work, what is the reason? If you don’t understand the cause, you may end up feeling the same at a new job. Perhaps it’s only a certain aspect of your current work that you don’t like. To make an objective evaluation, write down the pros and cons of your present job. What you like and don’t like about your company, your position, your pay, your co-workers, etc. Once you identify the problem, you’ll have a much better idea about how to resolve it. 3. Ask yourself: Have I outgrown my work environment? We change as much as our lives change. Feeling unhappy at work doesn’t necessarily mean you’re in the wrong field. Perhaps all you need to do is redirect your energy toward another path, within your chosen field, that inspires you more. Take some time to consider your passions. Evaluate how you can cultivate the next phase of your career by adjusting your trajectory a bit. 4. Ask yourself: Am I disenchanted with my mission? Look back and reflect on why you chose your current career in the first place. Are you really disappointed with your career path? Or do you just feel a little disconnected at the moment? Can you advance your participation in some aspect of your work to regain a sense of purpose? What other projects can you get involved in at work? Are there any open positions in your company that may interest you? Carefully evaluate if you really don’t love your profession anymore, or if you simply need to find a new way of attending to it. If, by now, you have figured out that something needs to change at your job, start with your current work environment. Change what you can from your end. Talk with your co-workers, your supervisors, or your boss about any problems you identified. If they value you, they’ll be open to helping you, compromising with you, and solving the issues. What If It’s Truly Time to Find a New Job? If you make a thorough evaluation of your problem and try to implement changes, but still feel that your being unhappy at work is tied to your current occupation, then it may really be time to find a new career. Just remember that every new job will come with its own unhappy moments and troublesome circumstances. Moreover, keep in mind that while you’re searching for another career, don’t disengage from your present work during this process. Ignoring your current responsibilities will hurt your professional relationships. On the other hand, maintaining a positive attitude and doing good work throughout your transition can open future opportunities. Be determined to make your time count, so that you can move on to your new career without any regrets. Mirela Bitkowski, MA, LPC Intern, sees couples and individuals at the Relationship Counseling Center of Austin. Mirela can help guide you through many of the hurdles that a career shift may bring to your life. To schedule an appointment with her, call (512) 270-4883, ext. 103, or request an appointment with her on the RCC Austin Scheduling page. The birth of a baby, the start of a new job, the termination of a relationship, becoming an empty nester, selling your home and moving to a new city: these are just a few of the numerous changes life may have in store for us. Change can be scary, but it’s also an inevitable fact of life. Some changes come by choice, while others may take us by surprise. Even changes that are made by choice can eventually leave us feeling out of control. Let’s say you’ve chosen to begin a new job in a new state – it sounded fun at the time, but as reality sinks in, the excitement wears off. Something that you chose, now feels completely out of control. However, when you set goals in advance, you can create a clear plan. This way, when you begin to question or doubt yourself, you’ll remember why you made the initial decision. For example – is this move to better your career? Remind yourself of all the pros this job has in store. Is this move a result of feeling stagnant at home? Goals can remind you of all the reasons you needed that change. When you set clear goals, and follow through with them, you’ll feel more at ease with your decision. Setting goals will give you the opportunity to hone in on what in life is most important to you. When you set goals, you’re able to re-focus on the direction you want our life to take. For example, if raising family is your number one priority, many of your goals will be focused toward your spouse and your children. You may set goals about how many kids you want, what age you want to have them, how many years apart you want them to be, etc. The transition of adding a baby to your life can be scary, especially for new parents. But because of the goals you’ve set, you’ll feel less scared and more prepared for this decision. When the negative aspects of the transition occur, you can rely on your goals to remember that the pros outweigh the cons. Unexpected change is extremely difficult to navigate, but by creating goals, we can better move forward. Grieving the loss of a long-term relationship, for example, is a change that we generally don’t anticipate; however, when we use this as an opportunity to set goals, we can make meaning from this change. Take time to reflect upon and look back at what went wrong to determine how you can make things better going forward. Your relationship didn’t end out of the blue – determine the defining factors and set goals to ensure you don’t experience the same thing again. These goals can be what you’ll look for in another relationship, or they can be goals centered on what you want to do with your life now that the relationship is over. Change can elicit a vast array of feelings, all of which are valid. But goal setting can allow you to more better prepare for and manage these feelings. When you set goals, you can feel at ease even when you’re navigating through tough transitions. Finally, be sure to seek help if you need it, as well. Goals supported and clarified with the objectivity and encouragement of a therapist, will feel that much more solid and achievable. 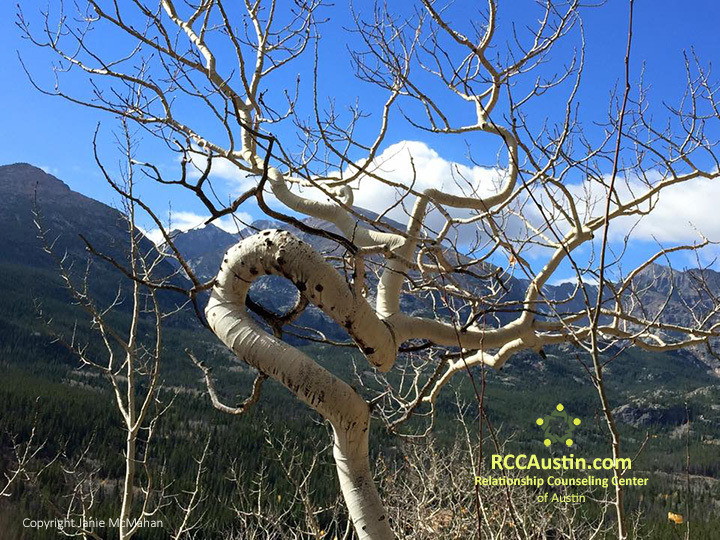 Working with individuals and couples during life transitions is a specialty area of counseling practice for RCC Austin counselor, Roy Faget. To schedule an appointment with him, call 512-270-4883, ext. 109, or request an appointment with him on the Scheduling Page on our website. What is Resiliency and Why Does it Matter? We’ve all heard about ‘resiliency’, or the ability to quickly bounce back from a challenging situation. But how does resiliency work in the psychological sense? Basically, when you encounter life’s hardships, how do you cope? Are you able to pull from a strength that lives deep inside of you? Or, do you shut down emotionally? Truly resilient people can recover. What are some traits of emotionally resilient people? Those with higher levels of resiliency don’t let themselves become absorbed by the challenges they face; instead, they find a way to grow stronger than what attempted to destroy them. They do this through optimism, positivity, and acceptance. They maintain the ability to view failure or challenges as an opportunity for growth. This kind of acceptance is in no way easy, especially depending on the level of the emotional challenge. Emotional resilience includes accepting the painful feelings and emotions instead of just ignoring them. People who have resiliency trust that in the long run, things will get better; they have the knowledge that this won’t happen immediately, but by pushing through and feeling their authentic emotions as they come, the pain won’t last forever. Resilient people also keep things in perspective and don’t lose hope in the face of destruction; this is possible only by letting go of the victim mentality. They welcome negative feelings but find a way to grow from them instead of dwelling on them for too long. This positive mentality gives them the ability to view challenges as opportunities for growth and is what really differentiates emotionally resilient people from those who aren’t. What is the importance of resiliency? Unfortunately, trauma, stressors, change, and challenges are all unavoidable. But it’s what we do with them that will determine if we’re resilient. Instead of using maladaptive coping skills or heading into severe psychological distress, those with resilience weigh out their other options. When you have the ability to keep fighting, you are more quickly able to get into a better headspace and move on with your life. We are a product of our environment and our experiences. People with resiliency don’t have an easier life than others, nor do they face fewer challenges, instead they know the healthier way to act upon them. They live by the mantra “if you can’t change it, change the way you think about it.” Those with higher emotional intelligence and resiliency can accept the challenges that life throws at them while figuring out a way to move forward. One of the many ways that psychologically resilient people are able to move forward is to create meaning from the challenges they’ve faced. This is no easy task but can provide just a glimmer of hope in dark times. This is why so many parents who have lost children to eating disorders, depression, suicide, and many other terrible diseases will create foundations or scholarships in their child’s name. While life will never be the same, they can create something positive from a truly horrible situation. While their lives will never be the same, the more room they create for resiliency, the less room is left for anxiety, depression and a multitude of other negative feelings. Resilience is not something that we are inherently born with, as it needs to stem from difficult times in life. Our family of origin and early caregivers can help us learn resiliency, but if you did not learn how to be resilient from your family, you can still become a person with resiliency. We can to look inside of ourselves and create the trait of resiliency. Resilience matters so much because it has the ability to completely alter our journey throughout this life. If you need help becoming a resilient person, a compassionate therapist can help you develop skills to become someone who can bounce back from the challenges that life throws your way. Call 512-270-4883 to schedule an appointment at the Relationship Counseling Center of Austin (RCC Austin). You can also request an appointment by visiting RCC Austin's Scheduling Page. It’s a common misconception that there is one, fixed way to deal with grief and loss. This is because we see mourning as a problem that needs to be fixed when this really isn’t the case. As uncomfortable as it is to deal with emotional pain, it’s something that we as humans all experience. It’s natural to search for a resolution that will stop our pain. Just as we have answers for how to heal a broken arm, we assume there are specific answers for how to heal a broken heart. But emotional pain varies tremendously from physical pain. The feelings that encompass emotional pain run the gamut: sadness, anger, fear, despair, denial, and guilt, even relief. The emotional pain that accompanies grief and loss not only varies from person to person, but from situation to situation. We mourn the death of loved ones, pets, losing a job, a miscarriage, the termination of relationships and the end of friendships. There are big and small reasons to grieve – moving out of your childhood home or graduating from school and entering the next chapter of your life are all reasons that people grieve. Obviously, the more emotional attachment you have to the person or situation, the more intense your feelings of grief will be. The typical stages of grief, the ones you’re probably familiar with are denial, anger, bargaining, depression, and acceptance. For so long, it was widely taught that these are the stages of grief, you reach them in that order, and then you move on. But this is not a true reality. While it’s normal to experience each of these stages, it’s equally as normal not to experience them. If you do happen to experience these stages of grief, it’s likely that they will not be in that exact order. Experiencing grief and loss is not linear. You may feel that you’ve hit “acceptance,” but that does not mean you’ll never experience the anger stage again. While there is no one right way to grieve, there are plenty of healthy ways. Reaching out to family members, friends and even a professional can help you feel less alone during your grieving process. It’s normal to want to isolate, but it’s also healthy to engage in the comfort of others. Grief doesn’t go away by ignoring it; pretending the loss didn’t happen will only make things worse in the long run. Allow yourself to feel the hard feelings for as long as you need to. Be gentle with yourself and don’t let other people get you down or tell you how you “should” be handling the grief and loss. Finding a creative outlet such as writing, journaling, drawing, dancing, or song writing can help you express your raw emotions. This is a great way of expressing yourself in privacy if you don’t feel like pouring your heart and soul out to others. It’s important that you don’t forget about your favorite activities, hobbies, social life, etc. You know yourself better than anyone, so don’t push yourself if you’re not ready, but get back into the swing of your old lifestyle when you can. Doing these things are a part of moving on but it does not mean you’ve forgotten about the person or reason behind your grief. Depression, anxiety, and fear are among the many emotions you may experience when processing your grief and loss. If you do experience these feelings, there is nothing “wrong” with you. Seek help from a professional who can help you cope in more productive and healthier ways. Call 512-270-4883 to schedule an appointment with one of the counselors at the Relationship Counseling Center of Austin (RCC Austin). Or, complete the form on the RCC Austin Scheduling page to request an appointment. Trust is tricky – it’s hard to gain and easy to lose. It’s also one of the biggest cornerstones of any relationship. When lost, the person betrayed may feel extremely devastated because it can completely alter the path of the entire relationship. We’ve all experienced some form of hurt or betrayal, but to what extent? The nature of the relationship, as well as the level of hurt we feel, will probably determine whether or not we’re willing to forgive the person who betrayed us. Forgiveness is easier said than done, and while there are consequences to holding a grudge, it’s not easy to choose forgiveness right away. It’s important to take the time to process and understand the situation before you delve into forgiveness. So how do you choose forgiveness? The first step in even considering whether or not you’re ready to forgive is to reframe your definition of it. Many people mistake forgiveness as “giving in” or condoning the actions/words of the person who betrayed you. Some people think it includes claiming that their actions actually did not have an impact on you. Forgiveness is NOT admitting that you were in the wrong when you aren’t. It does not mean you have to continue maintaining a negative relationship that doesn’t serve you. Once you reframe your definition of forgiveness, it’s a lot easier to acquire. It’s also important to look for the lesson in forgiveness. By focusing on gratitude you can figure out what you can learn from the situation instead of what was stolen from you. What if you can’t forgive? It’s a common myth that there are only two options once you’ve been betrayed: to forgive or to harbor a grudge. This is actually not the case. Full acceptance is a third, lesser-known option you can choose. You cannot force yourself to forgive unless you are emotionally ready. In a sense, acceptance is the step prior to forgiveness. By utilizing acceptance, you come to terms with the wrongdoings of the other person. Instead of seeking revenge or obsessing over the betrayal, you search for a reason behind it. Accepting without forgiving is still a big part of moving forward. Part of what makes forgiveness and acceptance so difficult is that once you’ve achieved them, you no longer dwell on what happened. You have officially made the decision not to continue mulling over, bringing up, or discussing the issue. As mentioned earlier, one of the benefits of forgiveness/acceptance is moving on and experiencing growth from the situation. This doesn’t mean completely forgetting about what happened to you, but learning from it and protecting yourself in the future. Instead of seeking revenge, seek to live your life the best way by moving forward. Call 512-270-4883 to schedule an appointment with one of the counselors at the Relationship Counseling Center of Austin. You may also request an appointment by completing the form on the RCC Austin Scheduling page. Life. It’s full of beauty, full of fascinating discoveries, full of surprises… and full of responsibilities. Your education, your job, your bills, your family. Everything is jumping, screaming, and begging for your attention. And more often than not, those things get your attention first—before yourself. In the end, your life always revolves around other people and other things. You judge your self-worth by your job title, your intelligence by your college degree, your physical beauty by your weight, and your social status by how well you fit in with others. None of that focuses on prioritizing you. Your wants, your needs, your values, your happiness. Can you even remember the last time you did something just because it made you happy? The last time you switched off and spent time with the people and things that matter to you? If you can’t, perhaps it’s time to set yourself as a priority in meaningful, everyday ways. But, is self-care really that important? When you treat yourself as a priority and practice self-care you learn to show love for yourself. Loving yourself is by no means a cliche. Nor does it mean that you’re self-centered or selfish. It simply means you’re showing yourself the compassion you’ve perhaps only shown to others. The amazing thing about prioritizing self-care is that it actually helps you with external associations. Your relationships with other people, the way you view unexpected situations, how you care for responsibilities, and much more. Because by learning to extend care and love for yourself, you’ll start nourishing your self-worth, fortifying your strengths, and building your resilience. You’ll cease the negative self-talk and leave the harmful coping behavior for your negative feelings behind. And you’ll quit overthinking every situation and stop making a mountain out of a molehill. In fact, you actually open yourself up to becoming more capable of showing compassion to others by being compassionate with yourself. Yes, the quality of your care for others depends on how well you care for yourself. The simple truth, then, is that self-care isn’t a luxury, it’s essential. Instead of it being just one more thing you “have” to do, you should actually make it a regular, refreshing part of your daily life—a lifestyle. Begin with your mindset. You have to be committed to making yourself a priority, to value yourself. That means asking yourself in every situation: How does this serve my well-being? This involves taking care of your body—internally and externally. It means getting plenty of rest/sleep, regular exercise, and healthy meals. How it aids your well-being: It helps you optimize your energy levels, giving your more strength and vitality to do things for yourself and your loved ones. This encompasses expanding your horizon. Instead of staying in your comfort zone, challenge yourself to try new activities that stimulate you mentally. Envelop yourself in extended studies, start a new hobby, join a club, etc. How it aids your well-being: It helps you shake off mental cobwebs, expands your knowledge and intellect, and renews your enthusiasm and zest for life. This includes processing and communicating your emotions, sharing them with trusted friends, family members, or perhaps a therapist. It means effectively dealing with stressful situations and releasing negative feelings in a constructive way. And it also calls for setting clear boundaries. How it aids your well-being: Keeping yourself emotionally balanced and healthy helps you to cope with painful experiences and minimize unnecessary suffering. This means taking the time to nurture your relationships with others. It should include spending time with those who are supportive and uplift you and minimizing time with those who don’t. It also involves continuously creating new and expanding existing friendships and connections. How it aids your well-being: It helps you avoid the negative impact of isolation and provides you with a reliable support network for tough times. Besides, hanging out with good friends, laughing, and having fun is an all-around happiness booster. As you can see, making self-care a lifestyle will help you enhance your overall feeling of well-being. Why not take a few moments and consider what you value most and what makes you truly happy and then incorporate these things into your everyday life. At the end of each day, ask yourself if you upheld your core values and what you have done for yourself that day. You don’t have to make drastic and monumental changes right off. Start slow. Take small but consistent steps to make yourself a priority. In turn, by learning to take care of your needs and to love yourself daily and consistently, you’ll increase positive energy you can then share with the world. Breakups can bring pain, sadness, self-doubt and a host of other unpleasant feelings. They can also leave you in a vulnerable state that’s difficult to recover from. Like any traumatizing life event, a breakup or divorce needs to be processed appropriately. While tempting, bottling up your emotions is a recipe for disaster. Find a trustworthy person to talk with, whether they are a therapist or a friend. It is a healthier way to escape your negative headspace. If discussing your breakup is too painful or intimidating, try writing about it. Journaling, creating art, dancing, playing music, etc. are all creative outlets that can help you create meaning from your pain. Because the end of a relationship elicits such strong feelings of pain and sadness, it’s important to surround yourself with positive people. While nobody can replace your former partner, being in good company can help you feel less alone. It’s also important to avoid toxic people when you’re in a vulnerable state. Positive friends provide positive distractions, while toxic people can be negative influences. They may also encourage you to engage in unhealthy coping mechanisms that will only make the period after a breakup worse. Allowing yourself to grieve the loss of your relationship is a difficult yet critical part of healing. Give yourself permission to feel exactly the way you do. Because we are each different and unique, we all process and experience situations differently. Don’t be too hard on yourself on days when you’re struggling. Avoiding using alcohol and drugs at this difficult time. Numbing the emotional pain you feel with substances will only prolong the grief after a breakup. In fact, it will slow your healing process. By allowing yourself to mourn your relationship immediately after a breakup, your feelings of grief and sadness are less likely to resurface later. Self-care is especially important after a breakup. Unfortunately, because of the way you’re feeling, this might be one time you don’t want to engage in self-care. However, something as small as reading a good book or watching your favorite TV show can be an act of self-care. If you’re feeling up to it, leaving the house for a bit for a massage or nail appointment are also good self-care coping mechanisms. Going for a walk and connecting with nature is always a good way to practice good self-care. Regardless of what you choose to do, it’s important to set aside time to tend to your basic needs. Breaking up with someone is not only a change in your relationship status but a lifestyle change as well. Maintaining normal eating, sleeping, and exercise habits can help you feel more grounded. By sticking to a schedule, feelings of normalcy can stabilize your life. If you’ve terminated your long-term relationship, chances are it was for a pretty good reason. It’s crucial to maintain perspective and remember what your relationship actually looked like. Don’t glorify it or place a rose colored lens over your relationship, especially if it was a toxic one. When you’re in the midst of a relationship, it can be difficult to find time to focus on yourself. The period following a relationship is the perfect time to get back in touch with who you are. You may be tempted to fill the emptiness you’re feeling after a breakup with another relationship. Give yourself time to recover from your heartache and loss before moving on to another relationship. Rebound relationships rarely go well. Many people lose themselves throughout the duration of a relationship. Use this time to rediscover yourself. What do you really like to do? What makes you happy? What are your likes and dislikes? Once you’ve established what you enjoy, take the time to actually do these things! Find healthy distractions and try something new. Do something that you’ve always wanted to but have never gotten around to. Take this as an opportunity to reconnect with friends or pick up fun new hobbies.